Film critic Roger Ebert has been unable to speak with his own voice since 2006, when he underwent surgery related to his battle with thyroid cancer. Since then, he’s been using a computerized voice (notably, “Alex,” a voice built-in to Mac OS X), to communicate all this time. 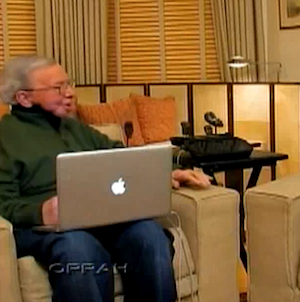 But today on Oprah, he’s debuting a new computerized voice: his own. If you watch the video at the bottom of this post, it’s pretty remarkable just how much it sounds like Ebert. He has a distinctive voice that a lot of his fans know well thanks to his many years on television reviewing films. You should also watch the longer version of the video here, to compare his new voice to his old one (again, Alex from OS X). So how was a company able to do this for Ebert? That’s maybe the most interesting part. As he explained on his blog a few days ago (Ebert is both a prolific blogger and Twitter user), Ebert stumbled upon a Scottish company called CereProc while surfing the web one day. Their specialty is text-to-speech technology, and Ebert found them because they’ve been recreating the voices of famous people. So Ebert decided to email them. They told him they needed good quality audio — which didn’t seem like a problem because of Ebert’s aforementioned television program. But there was another way. Ebert remembered that he also had recorded a number of DVD audio commentary tracks for many classic films, including Citizen Kane. So he asked the studios he had worked with on those if they had the pure audio tracks — and they did. Warner Bros., Criterion Collection, New Line Cinemas, and 20th Century Fox were all able to dig up recordings of Ebert’s voice. Yes, “Roger Jr.” needs to be smoother in tone and steadier in pacing, but the little rascal is good. To hear him coming from my own computer made me ridiculously happy. What will I use this voice for? I could talk with Chaz [Ebert’s wife] and our grandchildren — and it would be me, not Alex. I could do audio for Webcasts, talking under clips from movies I’m describing. I could do radio. I could tell jokes. It’s a pretty amazing story about technology.